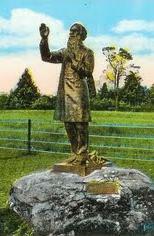 Forty-seven years later, October 29, 1910, at that very spot in Gettysburg, the moment of that blessing was again “frozen in time,” but this time it was done literally, with a bronze statue of Father Corby. Father Corby himself had long since passed, but many of the no-longer-young men who had received that blessing from him were there to honor his memory. As the American flag draped over the statue fell away to unveil once again the sight of Father Corby’s hand rising above them, no doubt more than a few brushed a tear from their cheek. The 100th anniversary of the dedication of the statue of Rev. William Corby on the Battlefield of Gettysburg took place on October 29, 2010. Okay, I'll bite. Is he called "Fair Catch" because he looks like a football player signaling for a fair catch. Gettysburg's answer to ND's Touchdown Jesus. Jim, I believe a replica of this statue stands at Notre Dame, and is called 'Fair Catch' Corby, a name we apply here to the Gettysburg monument. Atlanta this year. Negative on that, I was out in the boondocks at that time.